Coupon Scanner, Organizer and Reminder, this All-in-One coupon tracking app will make your life easier. 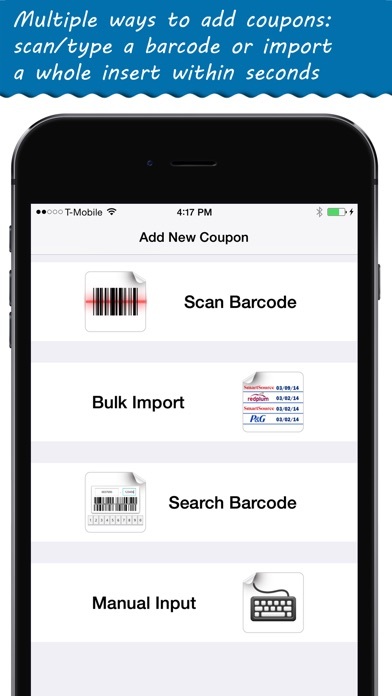 Scan or type coupon's barcode and let "Coupon Keeper 2" handle the rest for you. 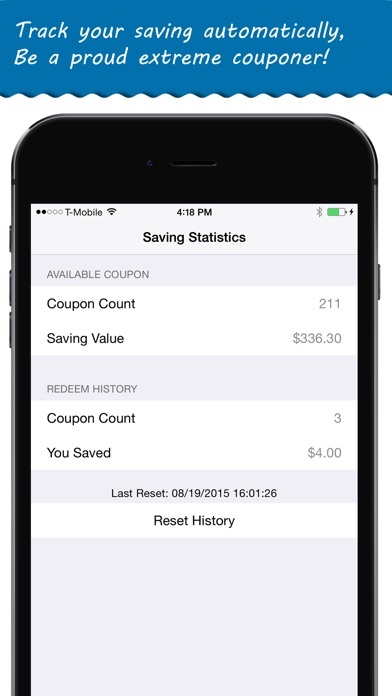 Do you want to save $$$ by using coupons but also want to SAVE TIME to input/organize/track your coupons? NO MORE to type everything!! JUST USE the BARCODE. "Coupon Keeper 2" is the upgraded version of "Coupon Keeper", another great app which has already being recognized by thousands of couponers like you with their coupon-shopping-life. Based on tons of great suggestions and feedback we have received, "Coupon Keeper 2" is reinvented to save not only your money but also your precious time. Main features: * Scan coupon barcode to input coupon details automatically; * Search coupon barcode to input coupon details automatically, it's very handy when your device has difficulty to recognize coupon barcode; * Bulk import coupons from Sunday newspaper inserts (U.S. only; upgrade required); * Huge online coupon database and keep growing over time to provide most accurate information; * Manually input coupon if scan/search doesn't work; * Get notification before your coupons expire, the notification can be customized to specified favorite level only or all the coupons; * Coupon Statistics tab tracks your saving; * Ranking your coupons and you will never forget the HOTTEST coupons; * Take photo of your coupons to help you to visualize them, it comes handy when to locate them from thousands of coupons; * Marking coupon as used will update your coupon statistics automatically; * Edit Name/Category/Value/Quantity/Expiration/Source/Detail for each coupon as you want; * Customizable categories and sources help you organize your coupons electronically and physically; * Badge number at list screen tells the coupon's available quantity; * Search though your coupons by name, category, source, details and notes; * Search though your coupons by scanning product UPC barcode; * Sort your coupons by Expiration Date, Name, Category or Favorite Level; * Filter your coupons by Category, Source and/or Source Date; * Separate 'Expired and Used' coupons automatically from other coupons and move to archive to save your time. But you still have the chance to review them at any time; * Customize your system to keep or delete the expired coupon automatically; * Clone coupon to make data entry faster; * Share the coupon with your friend by emailing the coupon details with image; * Import/Export coupon data to backup or just keep multiple devices data in sync; * Create coupon list (with or without filter) in spreadsheet format and view/edit using other program like Excel or Numbers; * Universal app can be running on iPhone/iTouch/iPad devices; * Coupon Keeper 2 is retina display compatible and support new iOS devices. If you are current user of "Coupon Keeper", you can export your data from "Coupon Keeper" and import into "Coupon Keeper 2" smoothly. Coupon Keeper 2 Lite has all the essential features of the full version of Coupon Keeper 2 except that it is limited to scan up to 20 barcodes and the import/export feature is locked. **Disclosure** - This app helps you to better organize/manage your coupons, but you STILL have to carry your physical coupons and redeem them at local store. Cool at first. App says I can earn free scans by sharing app to Twitter or Facebook, can’t because it says it’s not set up, there’s no where to set it up or to tell me how to set it up. Hit the contact button for support, nope, email isn’t set up, no where to set that up either. What gives?...app with no support and no way of getting any...really? Don’t waste your time. I love love love this app, it helps me see how much I’m savings. This app keeps all my coupons handy on my phone. I even upgraded and paid for the full-version, and I don’t regret it one bit. Awesome app!! I’ve been using this app for about 2 months. It is great to be able to know what coupons I have without rifling through each section of my coupon holder. 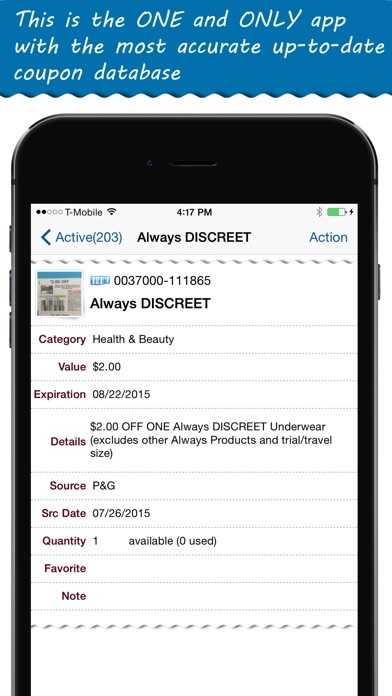 And to be able to scan a product to see if I have a coupon to match is very handy. Very easy to scan and add coupons and categorize based on my preferences. There is one change I would like to see that would make it 5 Stars. Can you add an option for when you scan a coupon that is already loaded to mark as used? It would be much easier to mark them used then to have to look them up by name and then edit. Other than that I love this app. Has trouble scanning coupons & the free version can only store 20 coupons. Will do for now, don’t think I will purchase full version, $13 is a lot to pay for an app. This app is great. It keeps track of my savings and helps keep my coupons organized. I purchased this app and absolutely love it! The only problem I have is when I switch screens, usually to check store ads, when I get back to coupon keeper it always scrolls all the way to the top of the coupon list. I wish it would remember where I left off. That’s super annoying! The app is user friendly! 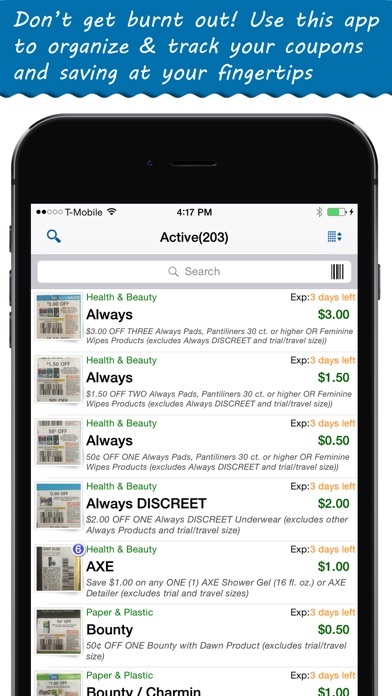 I hated to be in stores and be checking back and forth my coupon binder; with the app i can easily check which coupons I have available. Easy, faster, and organized.